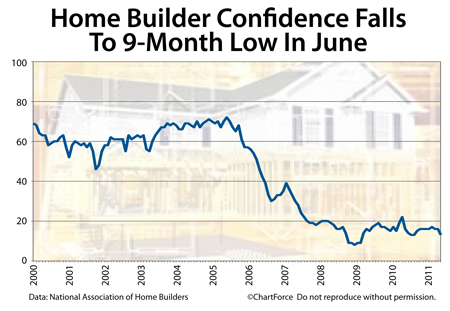 Despite rising new home sales and an increase in building permits nationwide, home builder confidence slipped to a 9-month low in June. The monthly Housing Market Index from the National Association of Homebuilders registered 13 this month — three ticks lower than last month, and its lowest level since September 2010. June’s 3-point drop from May is the biggest one-month move since May 2010, the month after the expiration of the federal home buyer tax credit. The retreat could signal favorable pricing for new home buyers in Nashville in the months ahead. When builders get less bullish on housing, they may be more willing to negotiate for upgrades and discounts. Ultimately, this can help new home buyers buy homes at better, lower prices. A closer look at the Housing Market Index shows why this may be true. When builders reply, their responses are tallied and mapped to a scale of 1-100. Readings over 50 are considered favorable. Readings under 50 are considered unfavorable. The HMI has not been higher than 50 in more than 5 years. In June, the HMI composite reading of 13 was anchored by falling foot traffic and reduced expectations for “future sales”. Homebuilders expect new home sales to be down through the New Year. Therefore, if you’re a home buyer in TN and have considered “buying new”, the time may be right for making an offer. Financing is cheap, home values are low, and builders are pessimistic — a terrific combination for today’s home buyer.